Why advertise in J.S. Paluch church bulletins? In today’s fast changing world, a customer is not a customer forever. Consumers continually look for new products, new service providers, and better customer service — and Catholic consumers first turn their attention to their weekly church bulletin to find all three. Well Established - J.S. Paluch publishes church bulletins across the U.S.A. and has been in the marketplace since 1913. Great Coverage - 97% of all households attending church take at least one church bulletin home every Sunday. 74% of all members of the household read the entire church bulletin. Great Value - 70% of all households are aware of and look at the advertising in the church bulletin. 68% of Catholic households are inclined to choose businesses who advertise in the church bulletin vs. other businesses in the same industry. Great Loyalty - 41% of households do business with a company specifically because they advertise in a church bulletin and support local churches. Great Product - 62% of households keep the church bulletin the entire week as a reference. Great Ownership and Management - J.S. Paluch is a family-owned business and was founded in 1913. J.S. Paluch has faithfully provided resources and revenue for the Catholic Church in the United States for more than 100 years. The J.S. Paluch ownership and Senior Management Team are dedicated to providing excellent resources and to maintaining great customer relationships. 97% of families take at least one bulletin home each week. 74% of all family members read every bulletin. 62% of all family members keep the bulletin in their home for one week. 70% of all family members consciously look at the ad page of the bulletin. 41% of all family members patronize a business specifically because it advertises in the bulletin. 68% of families are more inclined to patronize a firm that does advertise in the bulletin than a non-advertiser. 22% of families go out to lunch, brunch, or dinner after church each week. Who Will Read Your Ad? Reach out to potential customers in your neighborhood — and beyond! A yearly contract with J.S. Paluch means your message and your business remain front and center in the community. You are easily found when you are most needed. No other type of advertising keeps your name in front of your best potential clients for less. Each week, your contact information is handed out to everyone in the churches where your ad appears. More than 62% of all churchgoers keep this reference for the entire week. 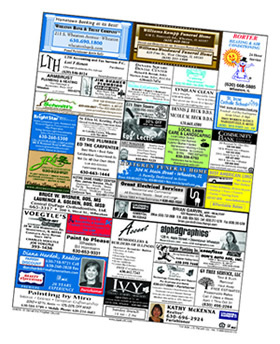 Churchgoers see bulletin advertisers as supporters of their parish and place more trust in services from local businesses. You have the choice of a 52-week contract or 26 week contract. A 4-color ad (in bulletins that support color advertising) is just 10% more — and we offer a 10% discount for multiple unit ads. A two-unit, 4-color ad in one bulletin for 26 weeks would only cost $463.32. There is no better value for direct-to-consumer print advertising out there! We’ll customize an ad package just for your business! I like the fexibility to change your messages as often as you like so I can do occasion-based messaging. The account service is very personal. They keep things updated and to the point so your questions are answered before you ask. VERY friendly staff that is aware of your needs and will do whatever they can. The staﬀ treats you with the utmost respect and really gets to know you as a person and your business in order to better help meet our business advertising needs.